"Write now is good. ": Grammar fun! 26 posts categorized "Grammar fun!" How data flows, Peeps secrets revealed, and "The Addictionary"
...explore how designers, statisticians, and computer scientists are using data to understand ourselves better—mainly through data visualization. Money spent, reps at the gym, time you waste, and personal information you enter online are all forms of data. How can we understand these data flows? Data visualization lets non-experts make sense of it all. -- "Little Red Riding Hood, the Animated Infographic Story"
-- "Visual Guide to the Financial Crisis"
-- "17 Ways to Visualize the Twitter Universe"
If you add a word or definition to the site, drop a comment here. I'll post a link to it so other readers can check it out. Members of the Twitterati may follow The Addictionary on Twitter. The site's "snowflakes" have a new book out, too—Addictionary: Brave New Words. * A video of the entire factory process would be even more enlightening! 1. Are you a "media stacker"? Read this TimesOnline article "Hello? I'm on the internet - and watching the television" to find out. 2. "The Buzzwords of 2008" is full of overused, wordy gems. On this New York Times' list, you'll find digital cliff, staycation, and Phelpsian, among many others. The article is co-written by Grant Barrett, "a lexicographer specializing in slang and new words, ... co-host of the public radio program 'A Way With Words' and head of the New Words Committee of the American Dialect Society." Accompanying illustrations by Jessica Hische are witty and original. 3. "This is where we live" is a stop-motion animation of a city made entirely of books. Over 1,000 copies of various books from U.K. publisher 4th Estate were used to make it. From ViaComIT. For $30.00, we are putting together a Mystery Box of three business books. In this box you are guaranteed one title that either won, or made the shortlist for, the best book of 2008 in its category, along with 2 other titles from last year that were submitted for the awards. As a bonus, we will include a copy of this year's In The Books, our annual review of business books. 100% of the purchase will go directly to Room to Read, and we'll cover the shipping on all orders. Room to Read promotes increased literacy in the developing world by establishing libraries, computer labs and even schools in communities with few educational resources. It is a powerful organization which makes real and lasting positive impact. If you're not familiar with the group, I suggest clicking through and looking at what they do; it is inspiring. 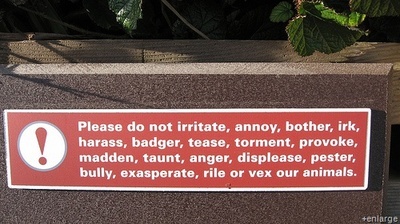 I would love to see the other signs in this zoo. Does anyone know where this is from? This image has been posted and emailed and re-emailed so many times, its original sourcing (if it ever existed) cannot be found. Learning to write well is a continual process. When readers ask me about how to become a better writer, I always say, "First, write every day." And I mean it. With writing, the only way to get better at it is to keep at it. Writing doesn't improve just by thinking about it. Then I give this advice: "When you write, don't worry about misspellings and grammatical errors. That's what editors are for." Writing and editing are completely different skills. Great writers often make spelling and grammar errors, and great editors and/or proofreaders are often better at catching mistakes than creating compelling stories. "10 wording blunders that make you look stupid"
"10+ tips for keeping your writing sharp and professional"
"10 flagrant grammar mistakes that make you look stupid"
1. Read your work aloud. The ear often catches errors that the eye does not. Know the rules, and the rules will make you free. The most typically inspiring words to writers focus on growing wings, dreaming big and believing hard enough. This grounding, practical advice stresses working within confines and structure first; the wings follow. Rules abound in writing—enough for everyone to follow some and ignore others. What rules do you follow in your writing? How do they help you? 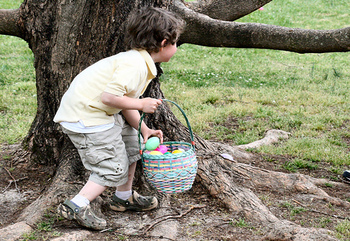 Photo: Easter Egg Hunt by Aim and shoot! Heard any good eggcorns lately? What does "ritN eng" mean to you? This book's cover "stpd" me in my "ritN" and "editN" tracks. Was it a published work which never met an editor? The official handbook of the International Creative Spellers Association? Or could this be expressed in ... text-message language (a.k.a., SMS)? 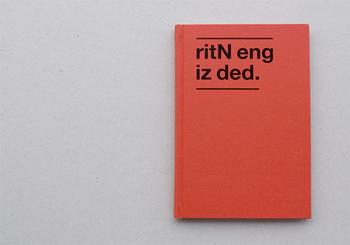 Swiss graphic design and new media student Clément Gallet lays it all out it his new communication manifesto “ritN eng iz ded”. In it, he posits that the speed of communication is moving too fast for our traditional written word system, and he gives suggestions on how to streamline language to work better with our new communication methods: texting, Facebook wall posts, and Twitter. One very successful novel has already been written completely in SMS. What will written language look like in 50 years if society's fast pace and technology's insistence on brevity win out? Love of grammar in the "real" world always catches my eye. 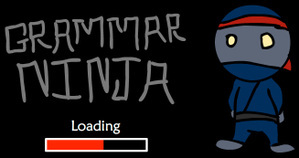 Someone really has a passion for grammar to have created this: introducing the game Grammar Ninja. Test your knowledge of grammar at three difficulty levels: beginner, skilled, or master grammar ninja. Lolcats are all over teh Interweb. Their creators combine extremely silly captions, photos of cute cats (and, increasingly, other animals) and similarly styled fonts to hilarious effect. Also known as "cat macros", these images spread via Web forums, email and now blogs. 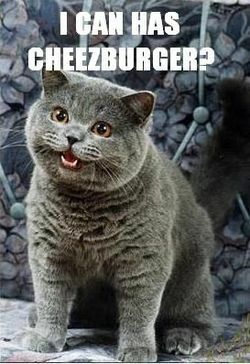 The popular site "I can has cheezburger" features new and classic versions of these images, and takes its name from the "original" lolcat shown above. On I Can Has Cheezburger, blog commenters write in what Dash terms "kitty pidgin" in response to posts. As many languages are currently in danger of extinction, it's surreal to see this living slang language evolving and proliferating. I wonder how long it will last — is kitty pidgin a fad, or will it become a firmly established sub-speak of "Web"? No matter its future, it is presently another example of how, in Blogville, grammatical slanderings and language misuse are getting the big laughs. Dash also provides a complete round-up of lol sites, and the comment thread brings in some additional lol sites, too. They are worth the trip — I was much more ROFL than LOL after checking them out. 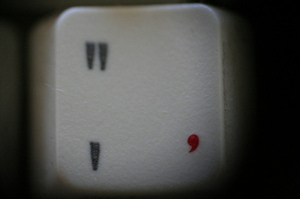 "...the lowly comma, correctly used quotes and other proper uses of periods, semicolons and the ever-mysterious ellipse." For the kids, there's Punctuation Playtime, an educational workshop that visits elementary schools around the world. The holiday even has an "official meatloaf" in the shape of a question mark (photo and recipe PDF available on the NPD site). I'm writing this in my calendar for next year. Here's wishing you and yours a happy, belated National Punctuation Day!